My local Target underwent a massive remodeling last fall to make way for the new grocery section. 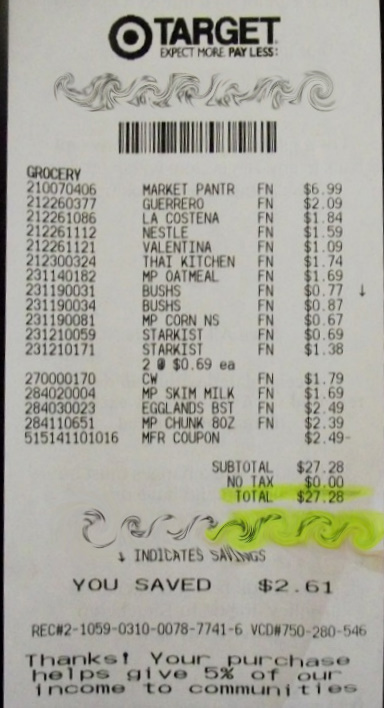 Those of you who have been reading PGEW for awhile know that I did a $25 Shopping Cart trip at this Target last year, leaving with a pretty good selection of food items I hadn't expected to find. So when I heard that they would be expanding that small food area into a full-service grocery section, I was eager to see what they would offer once it was complete. I must say they did a pretty good job. Somehow, without adding on to the original edifice, they managed to cram a good fifteen extra aisles worth of fresh, frozen, and non-perishable foods into my beloved Targhetto. Today I took the time to wind through each aisle, marveling at the great deals on some items, horrified at the prices of others. 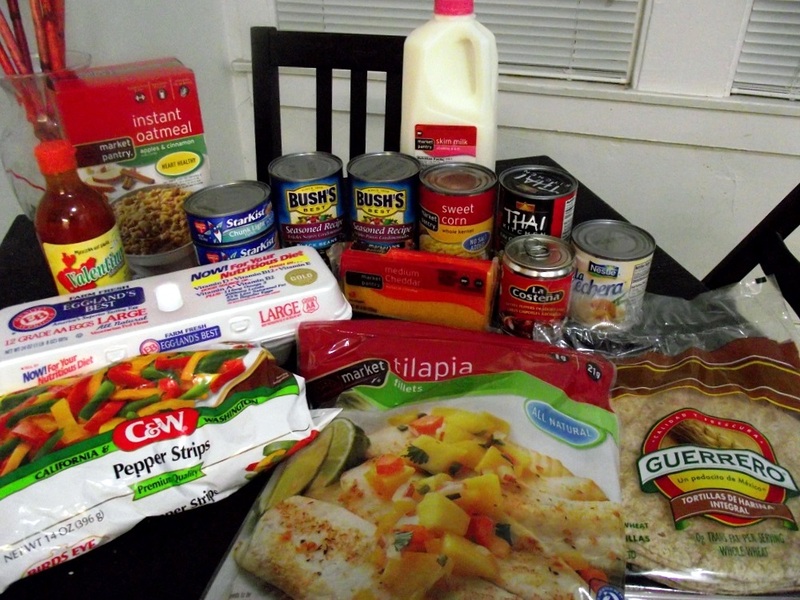 Overall, the selection is pretty good for a non-Super Target or full-fledged grocery store. The non-perishables included the usual amount of junk food they used to carry, as well as new things like organic tortillas, a large selection of coffees, and a fairly decent amount of "ethnic" foods & condiments. The latter was by far my favorite part, and it's nice to know that I can buy smaller bottles of Sriracha sauce or random Goya products whenever I'm at Targét to buy cat litter & new socks. Sadly, when I reached the produce section, my happiness turned to disillusionment; nay, it was absolute panic. I had entered the land of Scariest Produce Ever. Now, I know this makes me a produce snob, but I don't care: the amount of plastic & cellophane encasing every single fruit & vegetable in that area was a complete turn-off. Where was the freshness? Where were the imperfections on the apples, the dirt on the cilantro, the calling cards that let me know this food was, indeed, grown in real soil? They were nowhere to be found. Everything - and I mean EVERYTHING, except for the almighty banana - is covered in some sort of plastic. Do Russett potatoes and sweet yams really need to be individually wrapped in cellophane??? I suddenly longed for the natural lighting, the sounds, and the smells of my local farmer's market, desperate to be near real, fresh produce again. 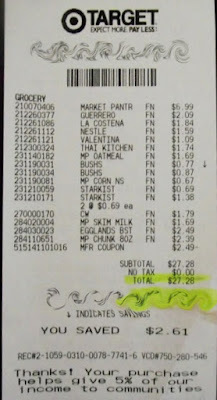 Grand total, after using one of my last Eggland's Best coupons: $27.28! Definitely not a bad run, and this certainly helps to add some life to the multitudes of Bare Bones staples I have sitting in my cupboard. As with all of my $25 Shopping Carts, I bought only what I didn't have on hand; things that would enhance & augment the ingredients I already had at home. What I purchased today was most definitely a hodgepodge of items, and in no way does this mean that I am only going to use these items to make my next few meals before "fun" paycheck rolls around next month. Again, this is just a tiny sampling of what I could make with what I purchased. Remember, the keys to a successful $25 Shopping Cart is not only to keep a running tally of what you already have at home so you can build on it, but to get creative and play mix & match with your new purchases! You'll be surprised at how many interesting options you can come up with, as long as you think outside the box. Okay, it's official: that groundhog LIED. Now, I probably don't have as much right to complain about the weather here in Northern California as the folks back East, but I'm going to anyway because this isn't something we're used to. Evil, freezing temperatures, hurricane-style wind & rain, and possible snow in San Francisco. IN SAN FRANCISCO!!! This is definitely not the California-lovin' weather I long for & miss ever-so-much. But no matter how much I dream of warmer temperatures, I know they won't be making an appearance for a long time because that cute little rodent who predicted an early spring is a compulsive liar (he did this last year, too). More often than not, cold weather makes people crave comfort food, and I am no exception to that rule. Ergo, I'm happily wrapping myself in the warmth & comfort of dishes like beef stew, casseroles, and hearty soups while we deal with these frigid conditions. But this time around, I wanted to try something a bit different that would be just as hearty and comforting as some of those other dishes. 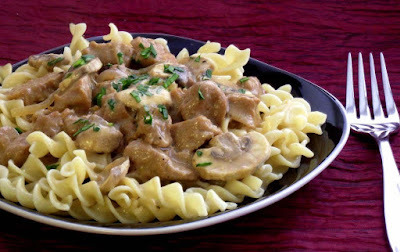 It had been approximately forever & a day since I'd last had a good beef stroganoff with tender beef, mushrooms and plenty of savory sauce atop a bed of noodles, so that seemed like a good idea. I had the noodles, I had the mushrooms, I had sauce fixings; but where was the beef? Sadly, not in my kitchen. Luckily, I still had a package of seitan hangin' out in ye olde fridge, a definite score at just $3.49 at the Co-op the last time I went. Though it's not as inexpensive as tofu, seitan is a fabulous alternative to meat, and it does a much better job of mimicking a meaty texture than its more popular soy-based friend. The few times I've cooked with it I've enjoyed it in place of chicken, so using it as "beef" was definitely a departure. I ran into a few roadblocks when it came to making the sauce, since seitan doesn't lend itself to browning as beef does. Part of what makes some sauces so incredibly tasty is that fabulous deglazing process, when you use different liquids to break up the browned bits left behind by the meat to create a flavorful base. But with the help of a few herbs & condiments, I was able to get a pretty decent flavored sauce that, while not authentic, was just perfect for my finished product. Combined with perfectly cooked mushrooms and some thick noodles, this made for a fabulous entrée that I served with a crisp salad for an easy weeknight meal. As I always do when I post a seitan recipe, I'm asking you to please proceed with caution if you have any sensitivity to wheat or wheat products. I'm lucky not to have these sorts of issues and consider myself a proud omnivore, able and willing to enjoy a variety of different foods. If you do have wheat allergies but still want to try this, no worries! 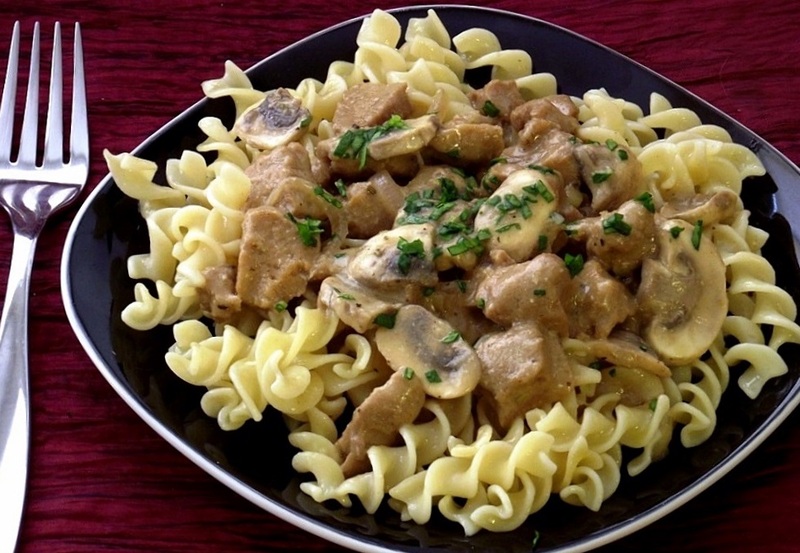 Simply omit the seitan and double the amount of mushrooms, and you'll have a fantastic dinner. Let's check out the recipe! Heat a large skillet over medium high heat and add the olive oil. Add the garlic & shallots and cook for 1-2 minutes, or until fragrant and just lightly browned. Reduce heat to medium, add the seitan and cook for about 3 minutes, followed by the mushrooms, herbes de provence and pepper. Cook for another 2-3 minutes, or until the mushrooms begin to release some of their moisture and start to become tender. 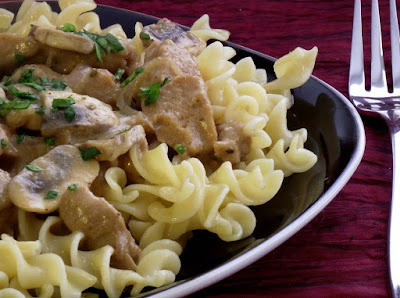 Using a slotted spoon, remove the seitan & mushroom mixture (it's okay to leave the shallots in the pan) and set aside in a bowl. In the same pan, add the Braggs/soy sauce and wine and bring to a low simmer. Quickly whisk in the yogurt (it helps if you've smoothed it out with a few whisks before adding it to the sauce; this will help avoid any curdling), and stir until completely incorporated. Allow to simmer gently over medium low heat for about 1-2 minutes, stirring occasionally. Return the seitan & mushroom mixture to the sauce and cook for another 3-4 minutes, so that the all the flavors are completely combined. Spoon generous amounts of seitan, mushrooms and sauce over a bed of freshly cooked noodles, garnish with chopped chives & freshly ground black pepper, serve with a nice salad, and enjoy! I know this one seems pretty obvious, and many people do bring their own lunches to work all the time. But you'd be surprised by how many folks don't, and it baffles me because the savings can be quite huge in the long run. Now, I understand that it's mainly an issue of convenience for a lot of folks. Most of us only have between thirty & sixty minutes for lunch, and access to a well-stocked kitchen in the workplace is pretty limited, if not completely unavailable. Many people also have several after-work commitments that make it difficult to prepare something ahead of time for lunch the next day. So, the common argument is that it's much better to walk or drive somewhere to pick up a quick meal and be on one's way. Sure, it takes some planning ahead to make sure that you not only have the time to make lunch, but the ingredients as well. However, the old addage of "time is money" couldn't be more true when it comes to going out vs. brown bagging it for lunch. 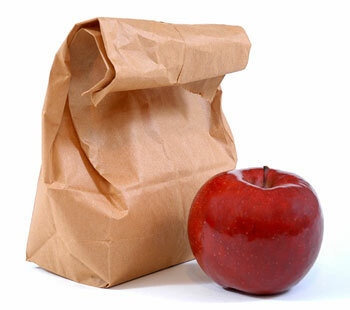 On average, people can spend anywhere from $6-8 on lunch they pick up from quick stop or fast food restaurants. A sit-down lunch at a nicer establishment can run anywhere from $15-25 when you factor in the tip. If one were to make this a daily practice, one could spend a good $120 in an average month, and that's at the most conservative level. Multiply that by twelve months, and bam! You've just spent over $1400 on going out to lunch. Ouch. And I'm not even factoring in the gas & mileage costs that you rack up getting to & from said eatery. Don't get me wrong, I love going out to eat just as much as the next person. It's nice to have some variety, and having someone do the cooking for you is fun, too. But when times are tough, it's not the wisest choice you could make. However, even if you were to switch to making your own lunch just once in an average 5-day work week, you could save close to $100 per month! That money could be put towards more healthy foods next time you go grocery shopping, or paying off the interest on a credit card, or many other bills. It may seem like a tiny change, but all those little bits can really add up to big savings. But Poor Girl, I just don't have time to make something the night before. Plus, I'll get bored! True... you could get bored if you were to stick with PB&J sandwiches or a can of soup. But there are so many options for quick & tasty lunches that don't involve a frozen meal in a box, many of which you can find right here on ye olde blog. As far as not having the time to make something the night before, most work places do have a break room with a fridge & microwave at the very least, and that's all you really need to make a quick lunch. You don't have to go as far as I do, bringing whole ingredients & spices to work so I can just whip something up on the fly; but it's not that hard to toss a can of beans & some leftover veggies into your lunch bag to make a lovely salad like this one. Or you can bring some leftover chicken, your favorite dressing or dip, and some pita bread, and in minutes you could be enjoying a tasty pita sandwich. So give it a try sometime. You don't have to do it every single day if you don't want to! But try to think outside the proverbial lunch box and consider how much better it will be for your wallet, and heck, even your waistline (some of those "healthy" options at restaurants aren't always what they seem...). Just one day of brown bagging it can make a pretty big difference. It used to be that there were just a few options for folks who were craving a big juicy burger. When I was little the choices included your standard fast food burgers, the burgers at your local greasy spoon, the amazing In-N-Out Burger (only available in Southern California when I was growing up; thank GOD we traveled a lot! ), or whatever you'd cook up in your backyard during summer barbeques. Nowadays, specialty burger joints are everywhere, offering anything from your standard cheeseburger with bacon, to more adventurous (read: ridiculously priced) burgers that will set you back about $80. Many of these newer establishments call the East coast or Midwest their home, but over the past few years some of them have found their way to the West coast. Five Guys - which happens to be President Obama's burger of choice, and which I have yet to try - is popping up all over California, and a couple others are making their mark here as well. But it's Denver-based SmashBurger that is swiftly becoming a favorite of mine. SmashBurger opened up its first Sacramento-area locations a little over a year ago. I'd heard plenty of hype about it on the local news, so I was curious to try them at some point. After all, any place that's going to offer me a burger with things like brie & bacon without charging $15-$20 for it has my attention. However, their locations are too far away for me to get to without a car, and not so easily accessible on public transit. Fortunately, my pal, Ms. Munchie, seems to score free tastings to SmashBurger pretty often, and she's been gracious enough to let me tag along with her to some of them. The NorCal Burger - so good, I can never seem to order anything else! My first visit to the Citrus Heights location was last summer, and I left relatively content with what I'd had. As planned, I ordered their NorCal Burger, which is the special "area burger" for this part of the state. Part of what makes SmashBurger unique is that, in addition to their regular menu items, each location offers one special burger to reflect the spirit & flavors of the particular city. The NorCal Burger definitely fits our style up here, topped with a thick slab of brie cheese, applewood smoked bacon, grilled onions, lettuce and balsamic-marinated tomatoes - a very NorCal set of toppings, indeed. 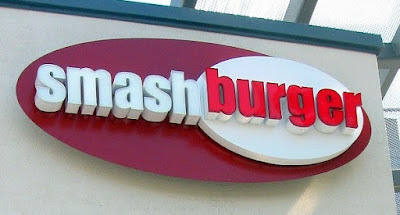 And after perusing the regional menus of other SmashBurger locations, it's safe to say that if I travel to any of these other cities, I will be trying that "area burger" (particularly the San Diego burger... OMG! ), because some of them look quite fantastic. Back to my first burger, though: I felt it was okay. I appreciated the brie and that smoky bacon, but it just didn't knock my socks off as I'd hoped. I remember telling Catherine that I felt it needed something other than mayo as a sauce, just to give it an extra kick. It wasn't bad at all, I just wasn't completely blown away by it. The SmashFries, on the other hand, absolutely sold me! 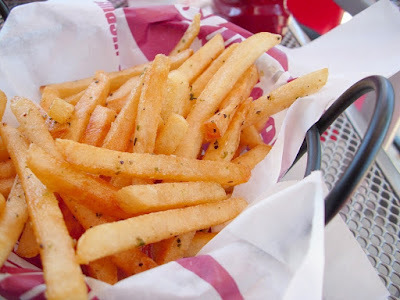 Thinly cut, hot crispy fries are tossed with the perfect amount of olive oil, rosemary and garlic, for a fabulous treat that puts many other fries to shame. It's not a rocket science flavor combo, but the ratio of each ingredient and the quality & freshness of the potatoes really makes these fries stand out. On that first visit, I think Catherine had ordered some of their Haystack Onions, and even though I'm not the hugest onion ring fan, I thoroughly enjoyed that side as well. Again, fresh, thinly cut, hot, and not swimming in grease. Major points for that, SmashBurger! On our next visit, they had just rolled out their SmashChicken menu, featuring both grilled or crispy chicken to go on their new chicken sandwiches. Since it was a special tasting event, we were encouraged to try some of the new items, so we tried one of their new chicken salads, some chili, and a sample of their crispy chicken breast. 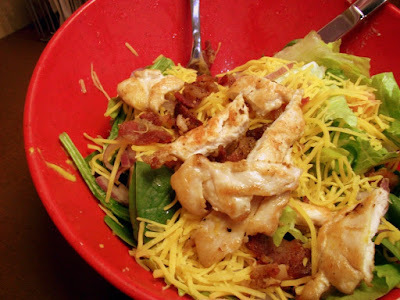 The Honey Mustard Chicken Salad was good, but I found the dressing to be a bit too rich for my liking. Catherine seemed to enjoy her chili quite a bit, and the giant Haagen Dasz shake she got also looked scrumptious. Both of us were a little wary of the crispy chicken, since most crispy chicken is either too greasy or too dry or 10 parts batter to 1 part "chicken". The crispy SmashChicken pleasantly surprised us by being a lightly battered, real chicken breast that was tender, juicy and flavorful. Way better than what you'll get at your standard fast food joint! But, we're both very set in our ways, so we also placed our usual orders: Spicy Baja Burger for Catherine, and a NorCal Burger for me. This time around, my burger did blow me away, and for awhile I was so blissed out I couldn't even think of what had changed to make it better. After collecting myself, I dissected each aspect of the burger, and soon enough realized that the "extra kick" I'd been hoping for the first time was actually lent by the balsamic-marinated tomatoes. I think my first burger only came with fresh tomatoes, and while I love those, they didn't offer the same delicious flavor combination as the marinated ones. But when served as written, this NorCal burger is just fabulous! I highly recommend it to those who are looking to enjoy something other than your standard cheeseburger. 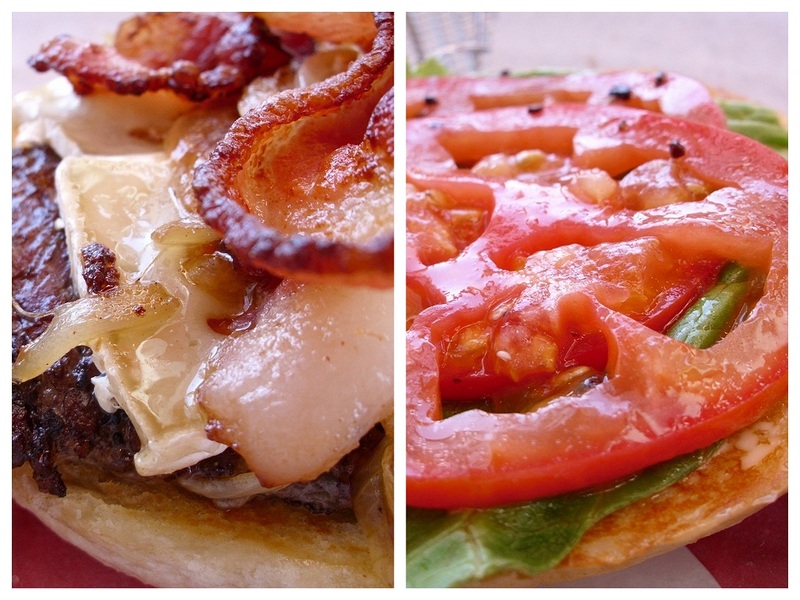 If you're into more conventional burgers, don't fret! 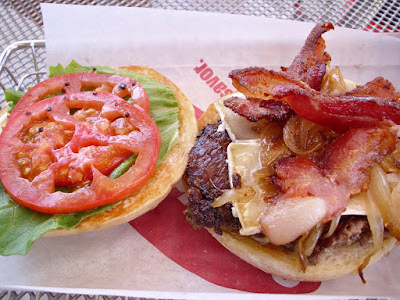 The regular menu at SmashBurger also offers the Classic, the Mushroom & Swiss, and the BBQ, Bacon & Cheese. You can choose your size of burger, too, which is great for folks who have lighter appetites but still want to enjoy a good burger. The selection of sides is pretty awesome, with your usual fries & onion rings, as well as more adventurous options like Sweet Potato Fries and Veggie Frites (sort of a fast-food style fritto misto). All sandwiches range from $5-$7 in price, which I believe is an excellent value, considering they use fresh, quality ingredients, and all their burgers are made from 100% certified angus beef. Most fast food chains will charge the same amount for lower quality food and a smaller, less interesting selection. All in all, I really enjoy eating at SmashBurger. As a huge In-N-Out Burger fan, I've always been a little wary of trying other burger joints, for how could they possibly compete with a classic Double Double and some Animal Style Fries? SmashBurger, however, has convinced me that there is plenty of room in my heart (and stomach) for another quality burger joint. Any good cook will tell you that mise en place - the French term for "everything in its place" - is essential when it comes to tackling any recipe. Being prepared is the best way to successfully prepare any dish, so that you're not fussing about the kitchen, hunting for ingredients or chopping things at the last minute when you're halfway through the cooking process. The following project I'll be sharing with you has taught me that mise en place is also important when you're shooting your first video recipe. It's not just all about having the food & equipment ready, and I learned that the hard way. About a week ago, I was lucky enough to receive a pretty awesome prize pack from Foodbuzz & ConAgra Foods that contained some samples and an awesome new Flip HD Camera. The challenge was to make a Super Bowl recipe with one or more of the samples that had been sent to us so that we could be featured in a Foodbuzz community ad, so I quickly got to cooking & recording. I had about three videos planned for this project and I was stoked! Unfortunately, once it was time to start editing I realized I didn't have the same video editing program I'd used for my first PGEW TV video. I hunted for programs I could afford (read: free), and eventually found one that came highly recommended by many sources. Too bad those sources were wrong! For the next week, I went berserk dealing with all the glitches & bugs, missing my Foodbuzz deadline and anxious to share my new recipes with everyone! I finally decided to go the old school route & use a different editor, which also kept crashing every time I tried to save something. At last, after hours & hours of sweat & frustration dealing with these evil, glitchy programs, I have finally created my first video recipe, and I am quite proud! It's no Oscar-worthy classic & there's a lot of work to be done for future videos, but considering I did everything by myself (hence the lack of interesting shots... no camera person! ), I'm pretty pleased. Just a few notes before I share the video & full recipe with you: First of all, I went ahead and did all of my potato cooking in the oven, but if you want to save some time, you can microwave your whole potatoes first and just continue with the rest of the process as written. As for the ingredients, I used some reduced-fat Monterey Jack cheese, but this would also taste pretty awesome with some pepper jack. And if you're not a fan of cilantro, feel free to garnish with some chopped scallions instead. Now, on with the show! Preheat the oven to 400°. Rinse & scrub each potato, then pat dry with paper towels. Rub a small amount of olive oil on each potato and place on a foil lined baking sheet. Bake the potatoes for 45-60 minutes. Allow to sit for a few minutes until cool enough to handle. Raise the oven temperature to 450°. 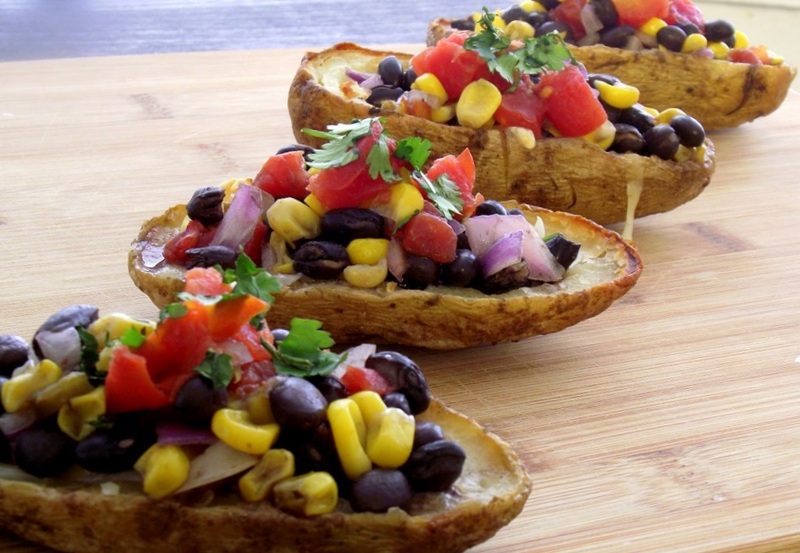 Cut each potato in half and gently use a teaspoon to scrape out the inside of the potato. Try to leave about 1/4" of potato in the skin so it's sturdy enough to hold the filling. Brush the remaining oil on the inside and outside of each potato skin, and place on a broiling pan with a rack. Return to the oven and bake for 10-12 minutes on one side; flip and bake for another 10 minutes. In the meantime, prepare the filling by combining the beans, corn chopped onions and stir together. Add about half a can of Ro-Tel tomatoes with chilies, pinch of salt and cumin, and mix well. 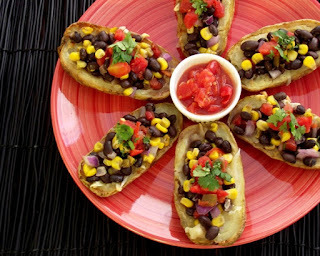 Remove the potato skins from heat and fill each potato skin with a small amount of grated cheese. Bake for five more minutes, or until the cheese has melted. Fill each potato skin with a generous amount of filling. 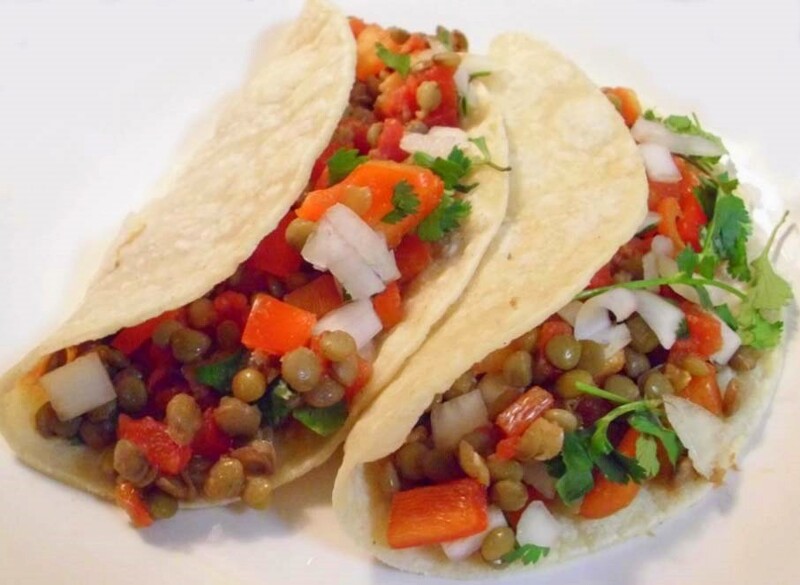 Top with a bit more diced tomatoes & chilies, garnish with fresh chopped cilantro, and enjoy! Well, we've made it to the second month of 2011, and I must say I'm enjoying this year so far! Granted, the weather could be a little better for everyone (I will refrain from gushing about this week's weather here in my neck of the woods), but other than that, things are going well. The new job is interesting & challenging, I'm finally able to wear matching shoes after two months of hobbling around with that silly foot cast thingie, and *drum roll, please* I am finally - FINALLY caught up on my rent!!! *cue applause* It's been quite a struggle, and it doesn't mean that I can go gallivanting to every mall & grocery store to start shopping, but let me tell you: it feels GOOD to know I'm caught up & current on something as important as rent. 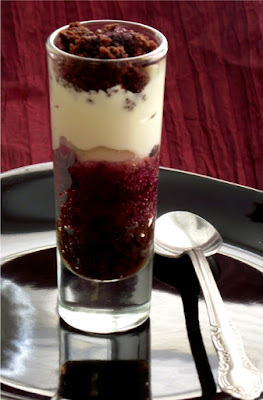 Speaking of which, have you signed up for PGEW Bits & Bites, the official Poor Girl Eats Well newsletter? If not, you can do so using the form to your left, or straight through the PGEW Facebook page! A few issues have already gone out, and so far folks are really digging it. If you get the chance, subscribe today & you'll have the latest issue sometime this weekend. The return of the $25 Shopping Cart is nigh! Though some folks wanted me to do a second Trader Joe's edition, the new grocery set-up at my local Target got the most email votes, so off to Target I go this month! If you're a Sac local and want to suggest a place for my March $25 Shopping Cart, comment below or shoot me an email! Now that the January Rules challenge is over, I feel a little less guilty about sharing some of the new dessert shot recipes I've dreamed up lately. 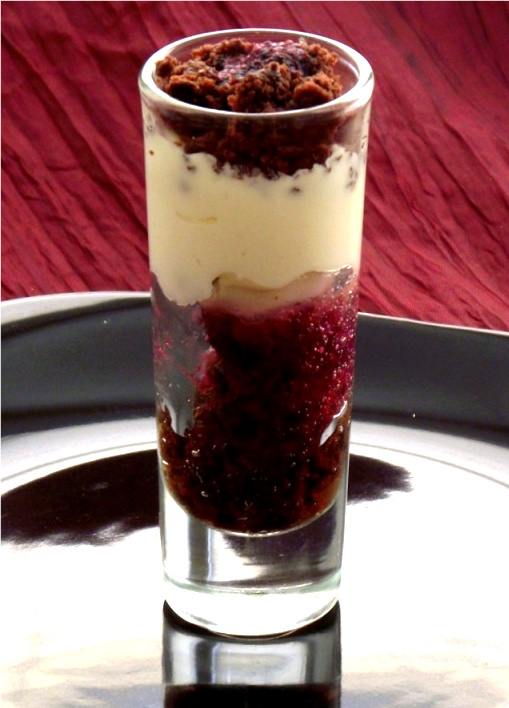 These tiny treats are sweet & slightly sinful, and perfect to share with your special someone on Valentine's Day. Stay tuned! Well, I hate to cut this short, but duty calls! I want to make sure this video gets finished & posted before it kills me, so I must get back to that. Wish me luck! 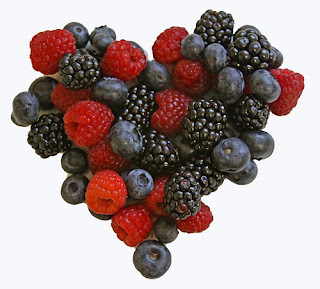 Have a fabulous weekend, and Happy February!